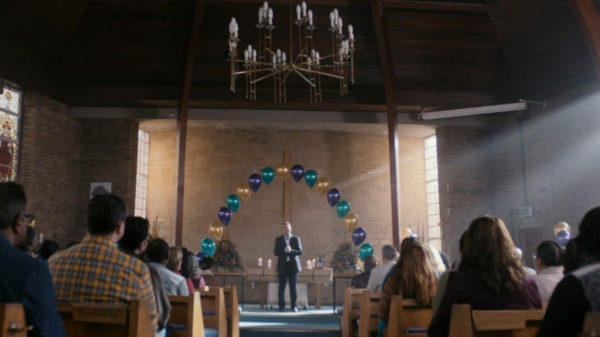 Posted January 14, 2019 by Andrea Laford & filed under General, Headlines, News, Reviews. 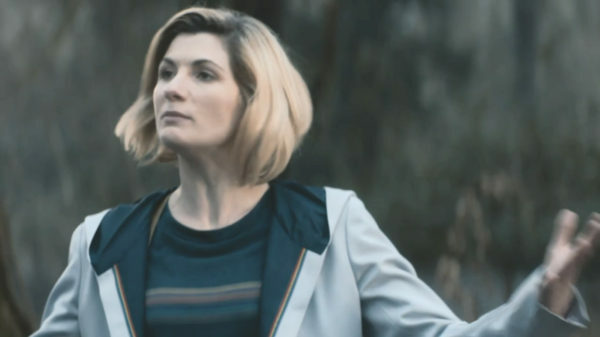 At least one scene from all ten episodes of Doctor Who Series 11, plus the New Year’s special, Resolution is included in this list. Every episode of Doctor Who ever made has its moments. 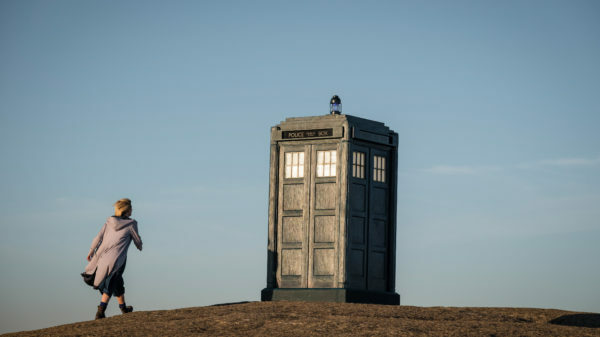 What’s a series premiere without spectacular stunt for the Doctor? 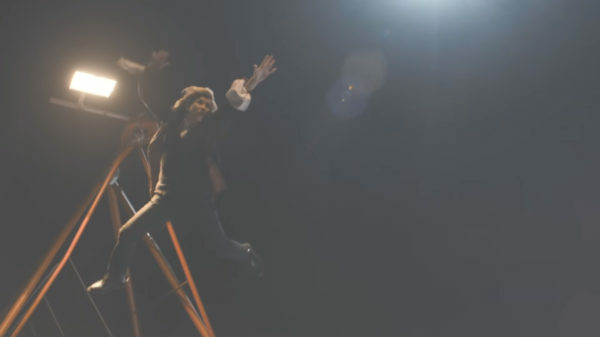 Jodie Whittaker described how she performed this leap from crane to crane herself during the panel after the screening of the episode in Sheffield. Graham’s poignant eulogy for Grace was an unforgettable moment in The Woman Who Fell to Earth. 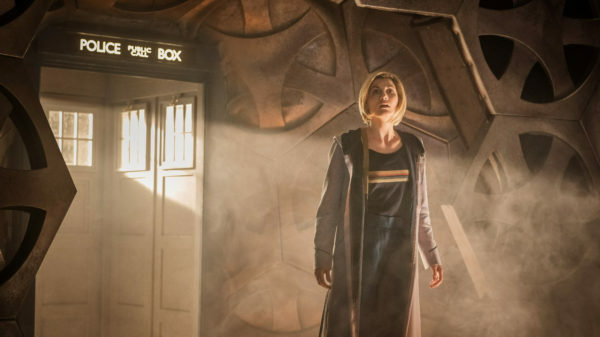 When the Doctor is reunited with her TARDIS in the Ghost Monument, we are not only treated to the culmination of her search for her only permanent companion but we also get a glimpse of the brand new interior. When Rosa Parks has her first confrontation with bus driver James Blake, it’s a battle of wills and a meeting of two superb acting talents. The episode, which I felt suffered from a desultory science fiction subplot, was at its best whenever the two characters shared a scene. RYAN: I read the letter. RYAN: From me dad. He said he’s sorry for not being there for me, for us, for Nan. RYAN: He wants us to reconnect. Says that I can live with him now, being that he’s my proper family. RYAN: I don’t like that he put that. Proper family. He’s not proper. 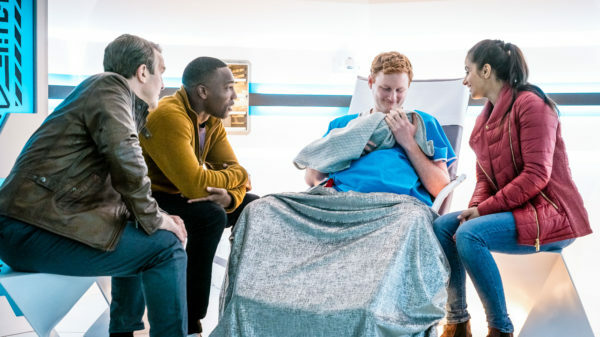 This is a brilliant moment in Arachnids in the Uk when it becomes clear that Ryan has come to care very much for Graham. 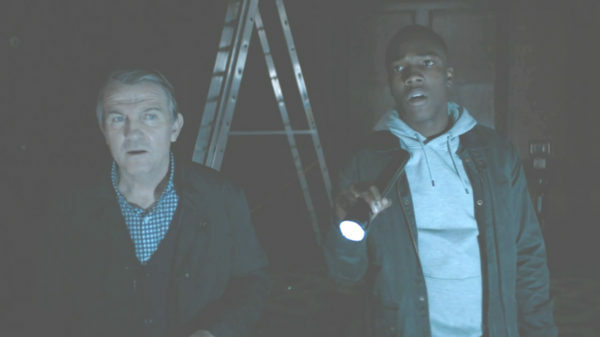 Unfortunately, the scene did not give sufficient time for the audience to to fully appreciate the moment or for Graham to react to Ryan’s words before Graham starts to enquire whether Ryan has checked the ceiling for spiders. This is a lovely subplot that completely rejects traditional gender norms and stereotypes, replete with male bonding. These words, began by the the unfailingly devoted android Ronan and spoken by the people gathered to honor fallen fighter pilot Eve Cicero brought The Tsuranga Conundrum to a conclusion which was made all the more poignant by the revelation that Ronan’s time had come to an end. Ronan is to be shut down because his time of service ended with Eve’s death. 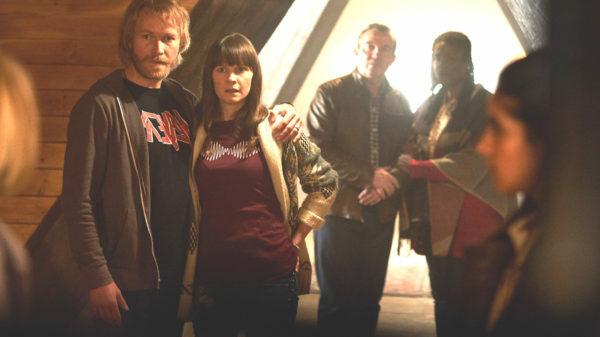 Eve previously described Ronan as her “consort”, an uncomfortable term for her brother Durkas and a term with a meaning not fully disclosed in the episode, leaving the interpretation up to the viewer. 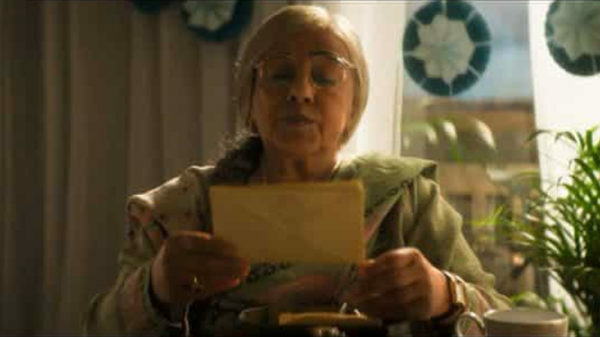 Yaz’s sassy Nani Umbreen uttered these words as she gave letters from her late husband to her daughter, Nadjia. I would have liked to have seen echos of Leena Dhingra’s delightful performance in her younger version in 1947 Punjab. The Doctor literally leaps with excitement when the Kerblam! 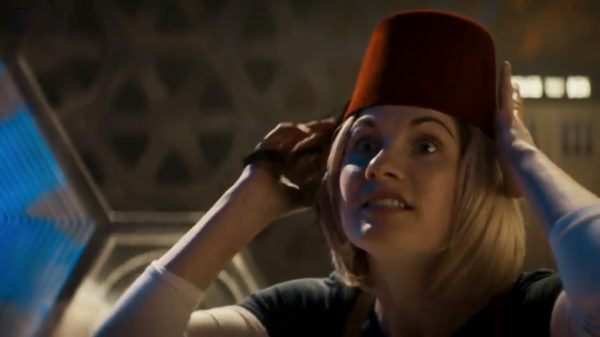 Man teleports into the TARDIS console room to deliver a Doctor Who callback in the shape of a very familiar piece of headgear. The scene was a joy to watch. “No, Kira, don’t!,” is what Charlie helplessly shouted at the one-way glass right before Kira Arlo met with her explosive doom in Kerblam! Millions of viewers shouted the same words at their television screens as they watched with the same sense of helplessness. Without any idea of the true nature of threat or a clear idea of who was behind it, we all had that sense of dread, knowing that nothing good could possibly come out of this special delivery with ultimately tragic consequences. The Doctor makes a statement to which every woman in any century can relate. Enough said. 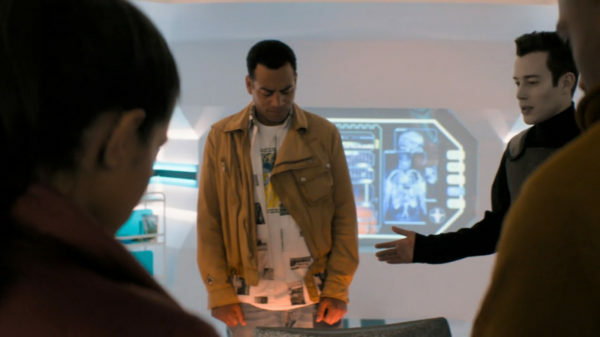 In Lewis Carroll style, the TARDIS team steps through the looking glass to find another universe where everything is backwards and defies the logic of the one they left. This new universe can think for itself and has adopted Grace O’Brien’s voice and inclinations. Leave it to a sentient universe to borrow from the best of Graham O’Brien’s tender memories. DOCTOR: Oi, Ux! Get in here! I know this will be way beyond your comprehension. Bigger on the inside? No big deal to the Ux, dimensional engineers who can affect the shape of the universe with their thoughts. Entering the TARDIS for the first time is not the usual stunning experience it is for most beings if you are Ux. If ever there was a Dalek to make one hide behind the sofa, this is it. Gone are the shrill, shouty, petulant Daleks and in their place is a cunning, relentless, worthy adversary for the Doctor. When the Dalek controls Lin, it’s more chilling and sinister than when it acquires armour.